Become a Sustaining Member and help animals like Hermes and Pearl 365 days of the year! The Sustaining Member Fund helped Pearl and Hermes, two endangered Hawaiian monk seal pups that were rescued on a tiny atoll named ... Pearl and Hermes! They were found underweight and malnourished. Once they had put on a healthy amount of weight and demonstrated the ability to eat fish on their own, Pearl and Hermes were released back to their home in the Northwestern Hawaiian Islands. A great way you can help ensure that the needs of each patient will be met is to make an automatic monthly gift. Your tax-deductible contribution may be relatively small each month, but they'll add up fast and give the Center an ongoing source of income we can depend on to perform life-saving surgeries, conduct advanced tests, and buy food, formula, antibiotics and other supplies that these marine mammals patients so desperately need for a second chance at life. As you might imagine, the patients at The Marine Mammal Center require care and attention seven days a week, 365 days a year. Our rescue teams and hospital must be ready at all times to respond! 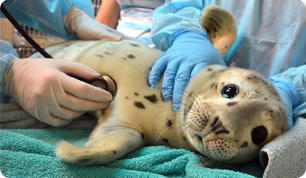 People like you who care deeply about marine mammals have chosen to give through our tax-deductible Sustaining Member Fund to help provide care for the patients. You maintain complete control over your giving and can adjust or cancel it at any time via a secure login. Each February, you'll receive a year-end statement of your previous year's giving to help make tax time a little easier. Your membership is automatically renewed. Contact Sheila by phone at (415) 289-7335 or by email at members@tmmc.org. To access your secure account, just click on the Login button found on the homepage of our website, enter your username and password (they can be re-sent if you've forgotten them) click on Update Profile, then click on Your Sustaining Gifts. * If you prefer to have your gift automatically deducted from your bank's checking account each month, please print and complete this form.